After 5 straights days of early wake-ups to cold, dreary rain, sleeping in on a Saturday and enjoying breakfast sounded like a much better idea then running. Back in Toledo, when the weather gets bad I tend to hit up the treadmill at our apartment complex, but on my last away rotation, it just seemed like a waste to brace the weather to drive to the gym, just so I can run in place. I’ve actually been pleasantly surprised that my runs in the cold rain have been pretty enjoyable, it’s just much harder to take that first step out the door on a Saturday morning. In fact, I’ve now made it my goal to run outside all winter this year. So in comes this amazing french toast, that can be made the night before and ready within 30 minutes of waking up on a sleepy Saturday. This is really the perfect meal for company because to make a double batch would be no extra trouble. It certainly beats sitting over the stove and flipping pancake after pancake while the finished ones sit in the oven getting soggy. Besides, I have always preferred French toast to pancakes, which likely stems from my childhood (okay..and high school..and college) obsession with all things French. This dish is really wonderful enough to eat on its own, with out added syrup or butter, which is something I would rarely say about pancakes. We served it with some turkey sausage, and it made for such a cozy warm Saturday morning. And thanks to some help from lululemon (my unfortunate new obsession), I still had a good run in the rain later that day. 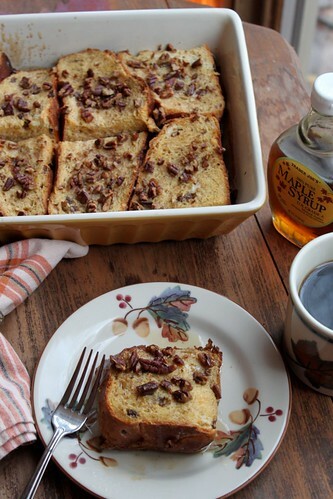 Combine the butter and brown sugar in a 9×13-inch baking dish. Arrange the bread slices in the dish. (It’s fine if they overlap.) In a large bowl, whisk together the eggs, milk, vanilla, cinnamon and ginger. Pour the mixture evenly over the bread and allow it to soak in. Top with pecans and nutmeg and cover tightly with plastic wrap. Refrigerate at least 3 and up to 12 hours. When ready to bake, preheat oven to 350º. Set the dish out while the oven is preheating. Bake until browned and set, about 35 minutes. Allow to cool slightly on a wire rack before serving. You can really ask anyone who knows me – I’m not much of a breakfast person. It used to be the standing joke that John would go out to breakfast with our friend Amanda and order and entire platter of biscuits plus other breakfast monstrosities, while I would go on a 20 mile run. It’s not that I don’t love breakfast food, I just don’t like eating it in the morning. Sometimes I wish that people went out to brunch for dinner. I would most certainly order a plate full of pecan waffles, slather them with syrup and not feel guilty at all about eating what is basically a dessert and counting it as dinner. However, I just don’t like doing this for breakfast. On any given weekday, I’m franticly trying to get out the door, half dressed and planning to put my makeup on at stoplights on my way to school. Breakfast is usually a granola bar I grab as I’m running around like a chicken with my head cut off. So the fact that I have eaten a warm breakfast everyday for the last 2 weeks must tell you that something is up. I don’t want to go so far as to say this oatmeal has changed my life, but after all they do say a good breakfast is the start to a good day and I have had a very good past 2 weeks. This dish has taken the reigns as the best oatmeal I have ever eaten, and this is coming from someone who usually eats oatmeal all winter. 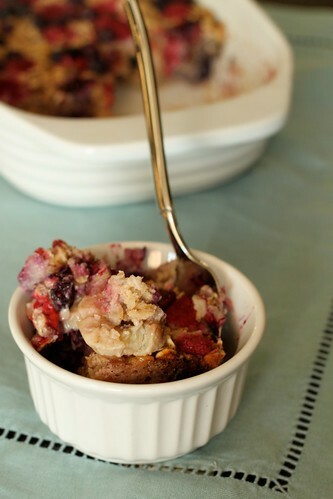 It’s moist, flavorful and filled with fruit. 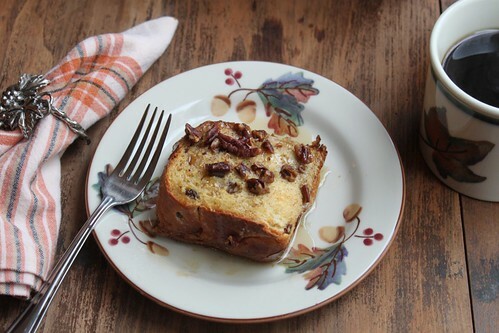 The flavor of the toasted pecans really come through, so don’t try to save yourself a step by tossing them in un-toasted. It’s a well balanced meal and it keeps you full a lot longer than a granola bar. I think that perhaps the best thing about this oatmeal is that you can make a batch and easily reheat it for breakfast for the rest of the week. Since I have no desire to get up earlier than necessary to make myself food, I have made this on Sunday night the last 2 weeks and then reheated it throughout the week. I ate it 5 days later and it still tasted great. I plan on making this many more times as the weather gets colder, and I can’t wait to experiment with an apple or pumpkin flavor. I’ll be sure to share those with you as soon as I’ve got the recipe down :-)! 1. Preheat oven to 375°. Grease a 1 & 1/2 quart casserole with butter or cooking spray. 2. In a medium bowl toss together oats, pecans, baking powder cinnamon and salt (dry ingredients). 3. In a small bowl whisk together the liquid ingredients reserving 1 T. of butter (maple syrup, milk, egg, 1 T. butter and vanilla). 4. Line the bottom of the baking dish wish sliced bananas. Then top with about 2/3 of the blueberries and/or raspberries. 5. Spread the oat mixture over the fruit. Drizzle the milk mixture over the oats, trying to distribute as evenly as possible. 6. 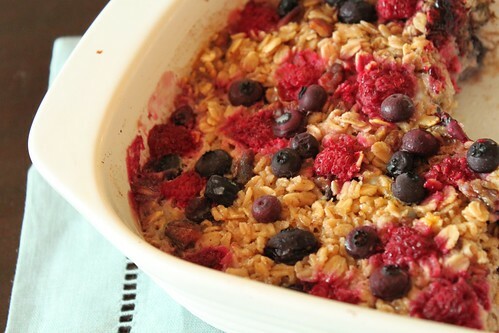 Bake the oatmeal for 35-45 minutes. Remove from oven and top with remaining 1 T. of butter. 7. Dish can be served straight from the oven and topped with additional toppings if desired. (I didn’t find this necessary). Alternatively, this can be made, refrigerated and individual pieces can be reheated in the microwave for about 1 – 1 1/2 minutes.